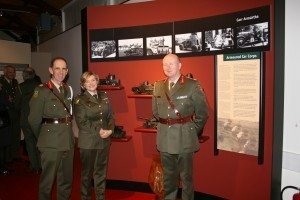 It is with great pleasure that the Military Heritage of Ireland Trust announces the opening of the new Military Museum at the Curragh Camp. This beautiful Museum is housed in one of the original permanent buildings on the camp. The building was originally a stable during the British presence in the Curragh and in fact a section of the original floor and troughs have been retained in the museum. Great care has been taken to transform the building into a modern museum which will take the visitor on a historic journey through time. The Museum reflects all the users of the Curragh, the Defence Forces, the racehorse industry, the sheep graziers and recreational users. In doing so, it recognises the responsibility that resides with all users to ensure its preservation for future generations. The Museum was officially opened by Lt. Gen. Séan McCann, Chief of Staff, on 18th October 2010. The Soldiers and Chiefs military galleries at the National Museum in Collins Barracks, Dublin, have proved to be hugely popular and are attracting a greater daily attendance than expected. These exhibitions increase public awareness of the story of the Irish soldier, one of the principal objectives of the Trust. To add to that knowledge and appreciation of the Irish soldier, the Trust arranged for series of articles on selected items in the exhibitions to be published in An Cosantóir and in local newspapers around Ireland, both North and South. Each article concentrates on a particular item in the military museum that caught the author’s attention and imagination, is of 300 to 500 words in length and accompanied by an appropriate photograph. The Trust now publishes these articles on its website thereby contributing to developing amongst Irish men and women, both at home and abroad, a greater knowledge and appreciation of Ireland’s proud military heritage which is common to the different political and religious traditions of this island. In response to an invitation from the Royal Irish Regimental Association in Northern Ireland, the Chairman and Directors of the Trust on Wednesday the 16th of February 2011 attended a briefing on a proposal to relocate the Regimental Museums in Northern Ireland to Cultra, on the southern shores of Belfast Lough. 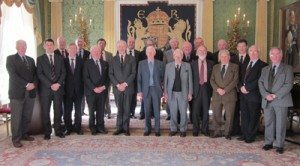 The briefing, held in Hillsborough Castle, was given by Lt Gen (retd) Sir Philip Trousdell KBE CB. As the occasion coincided with a Directors Meeting, the Trust was invited to also hold this in Hillsborough on that day. The Trust being an all Ireland organisation, with directors and members from both sides of the border, it was agreed that this would be an ideal occasion to hold a Directors Meeting in Northern Ireland for the first time. After the meeting and a coffee break, Gen Trousdell gave an in depth briefing on why the military museums in Northern Ireland needed to move, the attraction of collocating with an existing museum (the Ulster Folk and Transport Museum) and the type of exhibitions planned, using the term ‘gallery’ in preference to ‘museum’, telling the story of the people who served, their socio-economic background and history, as well as their experiences in the various military campaigns. The visit proved to be informative, and an opportunity to further improve friendships, North and South. in the company of Trust Directors and members of the Royal Irish Regimental Association. The Military Heritage of Ireland Trust CLG is pleased to announce the addition of a link to the website of the I.H.S.A., which can be found at http://www.irishhistorystudents.net/ The I.H.S.A. have kindly agreed to organise our annual Military Heritage Paper award project.